Does Aromatherapy Really Calm Dogs? 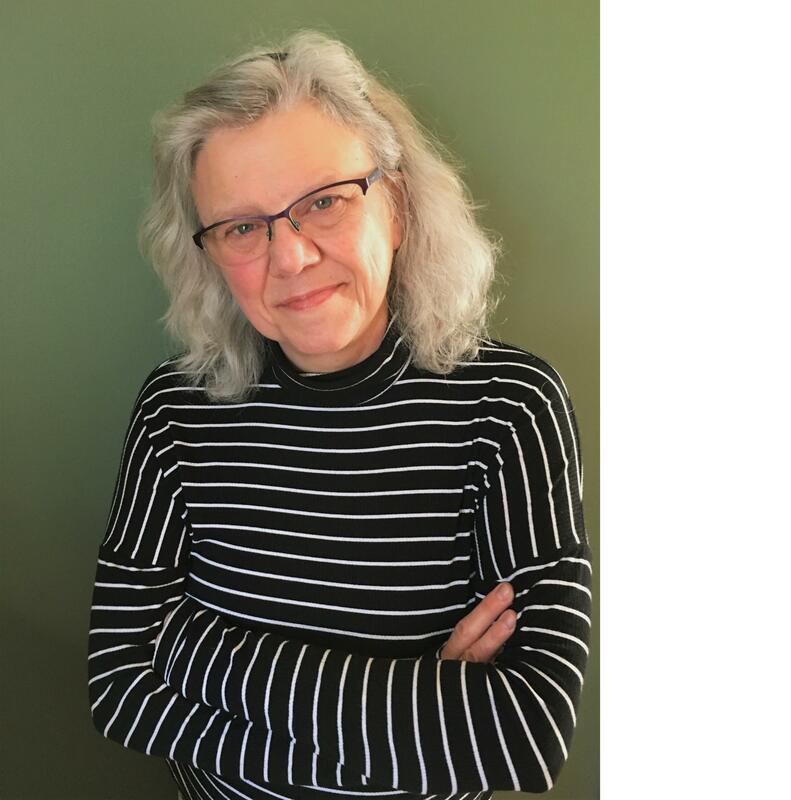 by Vicki Rae Thorne, certified aromatherapist &amp; herbalist, founder of Earth Heart® Inc. The use of aromatherapy with dogs is time-tested. Scientific studies in Germany and France regarding the medical effects of essential oils on animals and humans were quite advanced by the mid-1800s. Due to positive clinical results, the practice of veterinary aromatherapy was not uncommon in these countries by the mid-1900s. Aromatherapy, also known as essential oil therapy, is the skilled and controlled use of essential oils to restore or maintain health and well-being. Essential oils are volatile, aromatic liquids in the rind, flower, leaf, stem, root, wood, bark or resin of aromatic plants that are obtained by distillation, expression, and CO2 or solvent extraction. Fragrance oils are synthetically produced and are not therapeutic. Scent has been called “memoristic” because the olfactory bulb links to the limbic system, which is the seat of emotion, memory and learning. Scent molecules enter the blood stream through the lungs (inhalation) or skin (topical application). In addition to the memoristic connection, there is a physiological response - lavender is chemically sedating and has an effect on the central nervous system. Is aromatherapy safe for dogs? Safety starts with diluting. Pure essential oils are highly concentrated; it takes 200 pounds of lavender flowers to yield 1 pound of lavender essential oil. Some companies advocate using undiluted essential oils on the skin, and this just isn’t safe. It’s also not necessary when 1% (or less) of an essential oil single or blend is generally effective for dogs. Diluted essential oil remedies prevent overwhelming your dog’s sense of smell, irritating skin or mucous membranes or causing sensitization. Diluting also prevents overharvesting of precious plant resources. When aromatherapy is used responsibly, it can be a simple natural solution to help create a calm environment, soothe itchy or irritated skin, quiet digestive upsets, repel insects and heal infections. It can support the human-animal bond, facilitate behavior modification and improve health. Which essential oils can calm dogs? Bergamot (Citrus bergamia) can help balance emotions by soothing panic, snappiness, depression, frustration and irritability. Lavender (Lavandula angustifolia) is probably the most well-known essential oil for stress, fear, agitation, shyness and shock. Sweet Marjoram (Origanum majorana) is relaxing and grounding. It helps soothe muscle and digestive cramps, palpitations, excess sexual energy and grief. Rose Damask (Rosa damascena) is calming and stabilizing. It can help heal past abuse, nervousness, anger, fear and panic. Ylang Ylang (Cananga odorata) has a sedative action. It can soothe nervousness and insecurity, and it has been studied to help with nervous bladder issues. Frankincense (Boswellia carterii) promotes a calm state of mind and slows breathing during times of stress and fear. Spikenard (Nardostachys jatamansi) is grounding and calming. It can heal deep wounds, whether physical or emotional in nature, and is very helpful with PTSD. Geranium Rose (Pelargonium graveolens) is calming and balancing with moodiness and fear or insecurity. 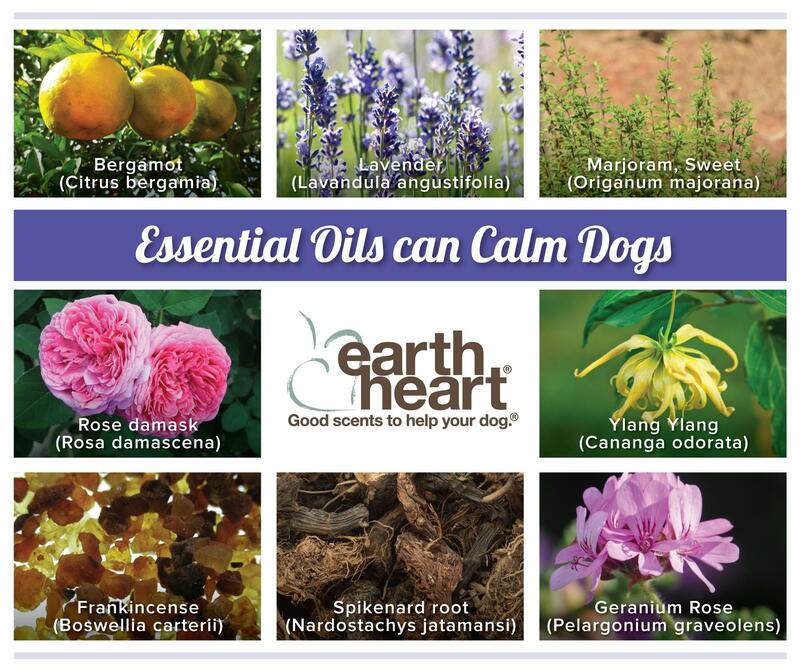 One way to help your dog relax is to use a calming essential oil remedy like Canine Calm® from Earth Heart® Inc.
Canine Calm® is an essential oil blend that was developed in 1999 for a boarding facility to help dogs in the facility who were anxious, agitated, angry or depressed. It worked from day one, and is now used to help dogs relax during thunderstorms, fireworks, boarding, grooming, training and competition, adoptions, holidays, bath time, crating, separation, hospice and clinic visits. The blend is responsibly formulated with 100% pure essential oils that have been clinically tested to help promote relaxation and reduce agitation, improve mood and calm fears. The topical sprays and roll-ons are diluted according to safety standards mentioned above for use with dogs over 10 weeks old. Because you control the amount and frequency of use, this allows the least amount for the desired result. Apply spray or roll-on to your fingertips and gently massage dog’s ear flaps or chest. Lightly mist bedding and your clothing or apply the roll-on to your wrist. Use with other comforts like calming music, treats, anxiety wraps and crating. A happy and heathy dog brings peace of mind to pet parents. An added benefit is that the remedies you are using with your dog can have the same effect on you! 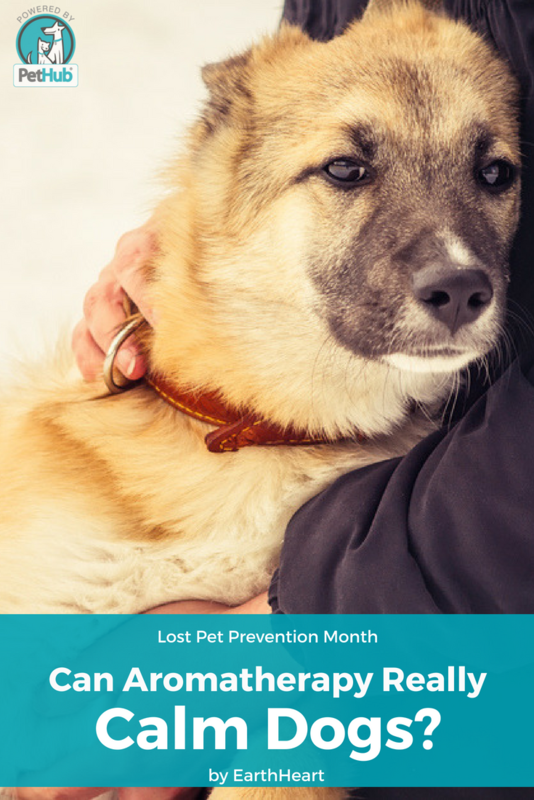 July is Lost Pet Prevention Month. EarthHeartInc.com is committed to help dogs and their families travel safely and calmly.